I have had my Brompton for coming up to six months. Before I even ordered my bespoke requirements I was intrigued by the Brompton World Championships. This even has been held for a few years now at Blenheim Palace. I watched lots of YouTube clips about it and thought, one day I'd like to enter that. Yesterday I got my chance. My phone vibrated and I took it out of my pocket and glanced at it nonchalantly. My nonchalant glanced turned to high interest when I realised that it was regarding the BWC 2011. A limited number of places had been allocated to those prepared to pay the £25 registration fee and ride for breast Cancer Care - a fantastic and worthwhile cause. More poignant as my mum had been diagnosed with this 20 years ago. I quickly registered and signed up. I am in. 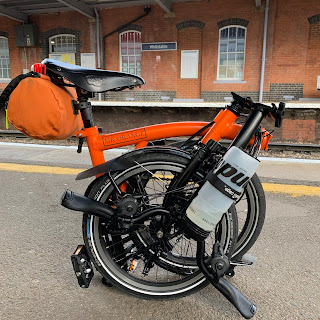 My dream of one day participating with like minded eccentrics (lunatics who love little folding bikes made by Brompton above all others) was going to be realised. As I write this I feel so excited and already looking forward to it greatly. I will of course have to put in a little training, so as not to embarrass myself as far as timings go. I believe there are some places left for those able to ride for Breast Cancer Care which would mean you would definitely get a place, weeks before everyone else. So, if you live not too far away or even if you live further afield, give it a go. If the videos on YouTube are anything to go by, it should be good fun!